Here’s another revealing addition from Ron Edge’s collection. It may be compared to the ca. World War Two aerial of Union Bay we published on the 20th of this month. This is also a photo from the sky, but one recorded to read like a map. In the almost illegible box lower-right it is identified as recorded in June of 1939 for the U.W.’s building department. 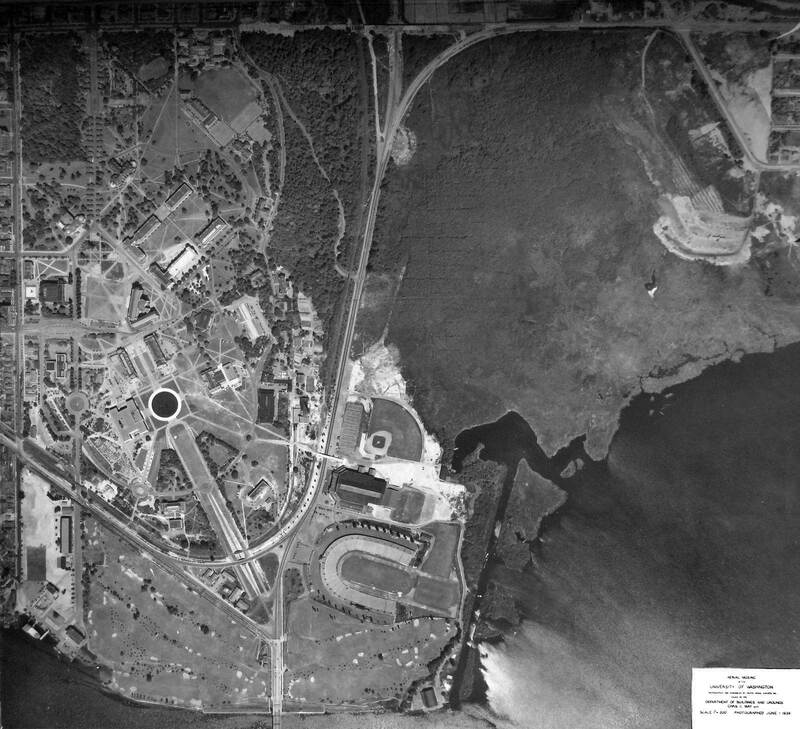 Note that the war time housing that would be upper-right is not yet developed, and neither has the future site of the golf driving range (top-center) been spread with sanitary fill. These are changes that both appear in the aerial published April 20. * The campus lawn between Meany and Suzzallo Library is still not bricked and yes there is no garage beneath it. * AYP circle on Stevens Way south of Architecture Hall, which was built for the fair to show art. * Stevens way still continues south under the railroad overpass and into Pacific Street. This is the line of the old Pay Streak or carnival part of the Alaska Yukon Pacific Exposition (AYP). * Showboat Theatre, foot of 15th Ave.
* No University Hospital / Yes golf course. * Construction work on the 45th Street overpass, top-center. * No new development “of note” along the eastern edge of the Main Campus above the railroad bed and behind Lewis and Clark halls. * No upper (north) end of Stevens Way loop to Memorial Way. * Smith Hall construction on the U.W.’s Quad. * Baseball diamond still – no Intramural Bldg. * Some fill work (or dumping) leads into wetland above the baseball diamond and further north where Montlake Blvd begins its turn to join with 45th Street. Are my eyes deceiving me, or has the Natural Amphitheatre become wooded over by 1939? You can sort of see a “dent” north of the old faculty club / Hoo Hoo House, but it looks like it’s been reclaimed by scrub growth and trees. The A-Y-P broke ground, opened, and closed in that dent, and even President Taft spoke there. By 1939, it appears that it was sylvan again. Now it’s just a parking lot. What a long strange trip.